Mitral facies is one of the cutaneous manifestations of systemic diseases. The pathology in question here is mitral stenosis. 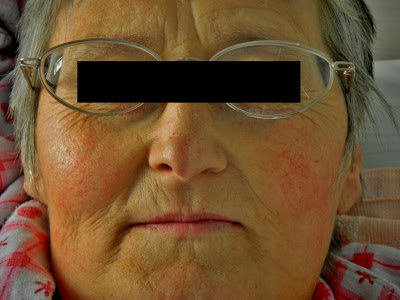 Mitral facies refers to rosy cheeks (bright circumscribed flush over the malar bones) with a bluish tinge. The rose colour is because of the dilatation of malar capillaries while the bluish tinge is because of the cyanosis. This facies is usually seen in long standing cases of severe mitral stenosis associated with pulmonary hypertension and low cardiac output. The picture above is that of a patient with chronic severe mitral stenosis. Yet, the rosy cheeks are not that prominent. The reason for this is that the patient underwent mitral valve replacement surgery and thus the cutaneous signs are regressing. Red cheeks may also be seen in weather-beaten people i.e. those who work a lot outside in the open air. Purple cheeks may be seen in congestive heart failure. Finally, in systemic lupus erythematosus (SLE) the cheeks will have a red raised eruption on the bridge of the nose extending to the cheeks, also called as the 'butterfly' distrubution.